After finding inspiration in the contemporary architecture presented at the Century of Progress Exposition in 1933, KU history professor James C. Malin designed and built one of the first ‘Modern’ houses in Lawrence. A radically new design in 1930s Kansas, even today the solid concrete ‘fire-safe’ home designed in the International Style might seem more fitting in Miami Beach’s Art Deco District. James, his wife Pearl, and their nine-year-old daughter Jane moved into the house in 1935. The house remained in the family until Jane’s passing in August. The home was recently purchased by our own Tim Hossler and his wife, Ann. As preparations start for restoration and renovation, Tim and Ann have invited Lawrence Modern into the Malin house during this transitional time. This is a rare opportunity to view a time capsule from 1935. Please join us for a tour of this one-of-a-kind house in Lawrence and celebrate the Malin family who lived in it for more than 80 years. Special guest Kansas historian Virgil Dean will speak on the importance of James C. Malin’s writings and teaching. Tim will talk about the house and their future dreams. Parking near the house is very limited. Please do not park in the old book store parking lot. It will cost you $180 to get your car back! We look forward to sharing the afternoon with you on the 28th. 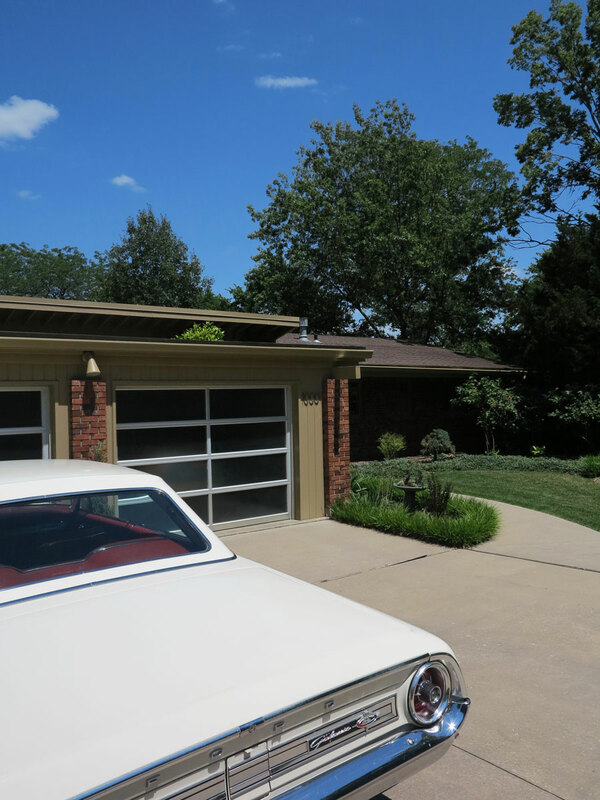 It is unusual for Lawrence Modern to stray too far off the midcentury reservation. But a recent visit to Sarah’s Fabrics downtown gave us reason to break loose. Yes, Sarah’s Fabrics, the old Mass. St. quilt shop with the creaky floors. 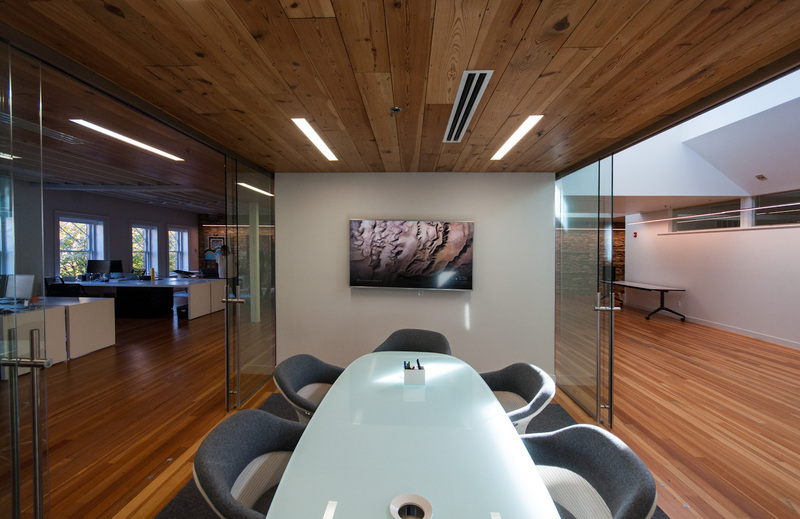 Owner Sarah Fayman, architect Scott Trettle and clark/huesemann architects have transformed the building’s long-neglected upper floors into a case study of modern mixed use. Balancing massive amounts of natural light and enough slick surfaces to send the editors of Dwell magazine into a frenzy, the 10,000-sq. 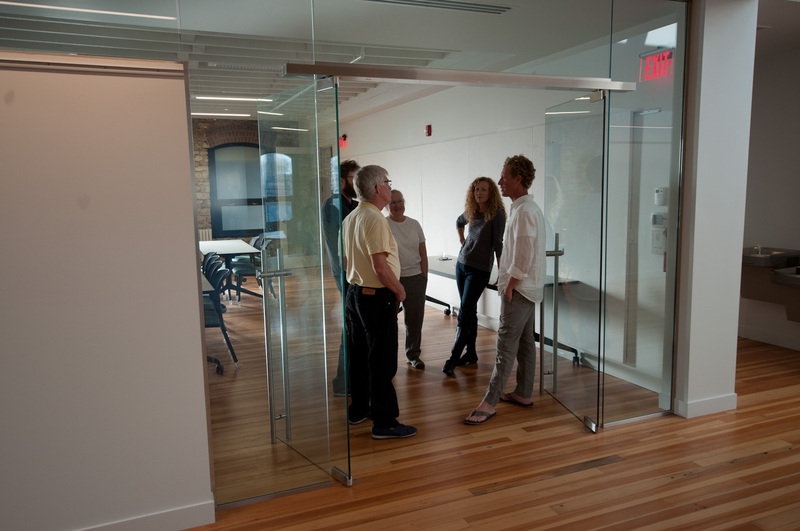 ft. rehab reflects the current trend in architectural design toward sustainability and adaptability. The renovated spaces include a large main hall for multipurpose events, a full commercial kitchen, office space, and a residential loft. 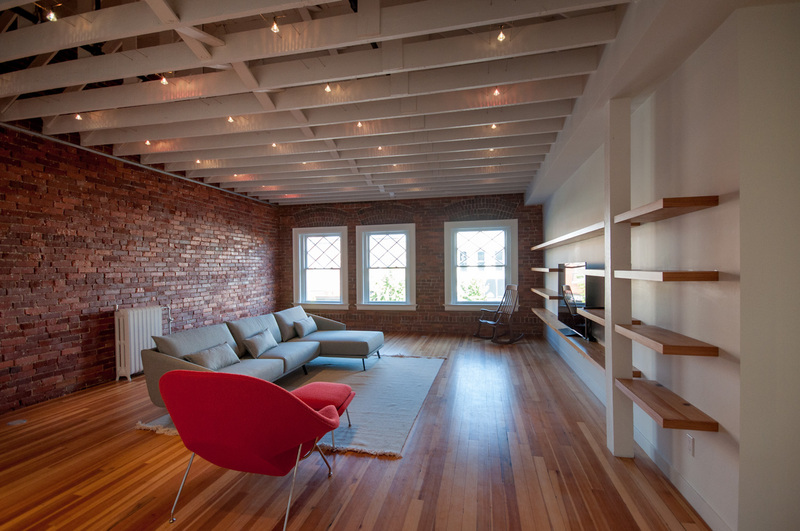 Original brick, stone, beams and reclaimed wood help preserve the building’s authenticity and connection to the past. Renovating old buildings with modern interiors is nothing new, but this kind of transformative repurposing is a welcome trend in downtown Lawrence, and one that caught us by surprise. Please join us for a special afternoon on Oct. 16. Scott Trettel, Sarah Fayman and our own Dennis Domer will speak about this remarkable creation. Please enter at 927½ Massachusetts Street. 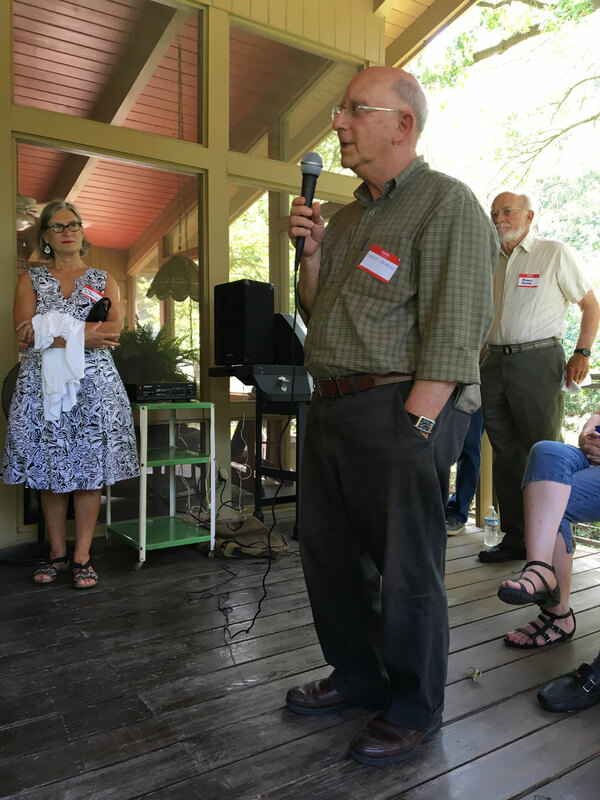 Tom Harper addresses the Lawrence Modern group at the “Cerf House” residence of Mark & Marsha Buhler, June 25. 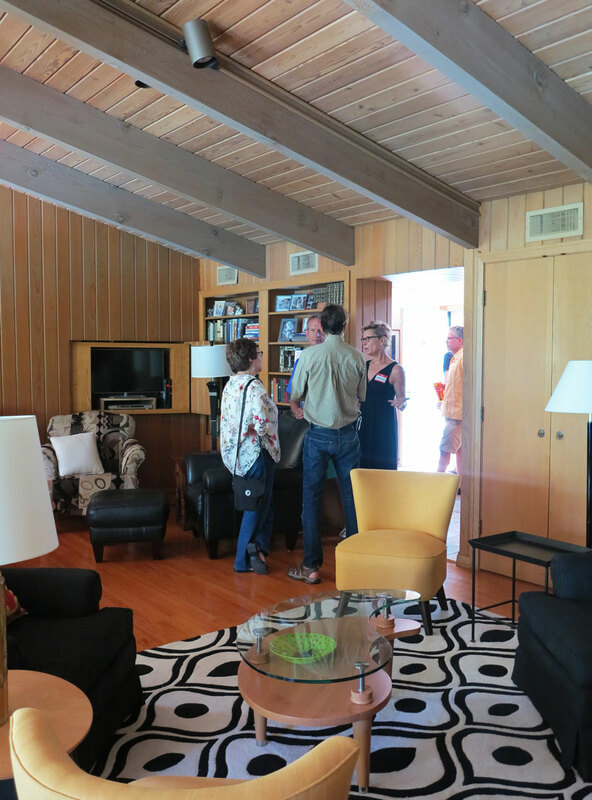 “Wouldn’t we all like to live here?” asked KU professor of architecture Steve Grabow to a Woodstock-like sea of people attending the Cerf House gathering June 25th. The response was affirmative, and predictable. Who wouldn’t? The Cerf House is the equivalent of a juicy steak, full of mouth-watering appeal on just about every level of midcentury modern fetishism: exceptional site, uplifting living spaces, superb material quality, dramatic entry, inside-outside integration that isn’t just a cliché, etc. etc. Perhaps most appealingly, the house possesses that enigmatic 50s coolness—how else to describe it? Julius Schulman did a masterful job of capturing it in photographs. But to truly feel and appreciate it one must experience it for real, which is the raison d’être of Lawrence Modern. 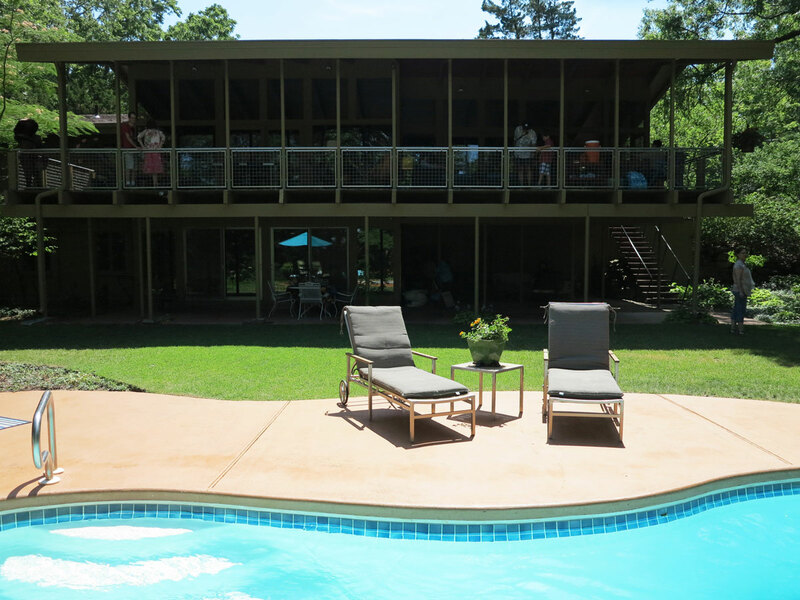 Thanks to all who made this event such a success and many thanks to our gracious hosts, Mark and Marsha Buhler, who have done a beautiful job of maintaining this classic of midcentury American modern architecture. When we talk about midcentury modern we’re usually talking about the 1950s, the sweet spot for modernism in America. Modern architecture in the ’50s, like American cinema in the ’70s, was an unusually fervent period of rules-breaking and risk-taking that we continue to obsess over. Which brings us to the Cerf House. Built in 1958 at the cost of $80,000—enough to buy a fleet of Cadillacs at the time—the house practically defies gravity. As extravagant as it is, however, like many other great examples of modern architecture from that era it’s not flashy or insecure. Its beauty lies within, built upon sound engineering and design principles that have kept it fresh for nearly 60 years. We are grateful to current owners Mark & Marsha Buhler for graciously allowing us to tour their outstanding home and talk about the interesting lives of the people who created it. To learn more about the Cerf House, check out our Baker’s Dozen write-up here. 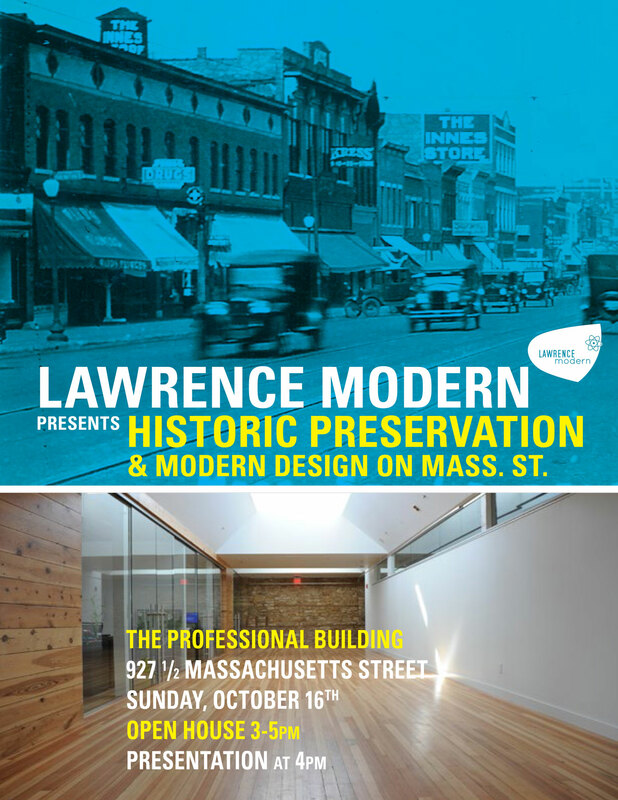 Some people have inquired how to join Lawrence Modern and participate in our gatherings. 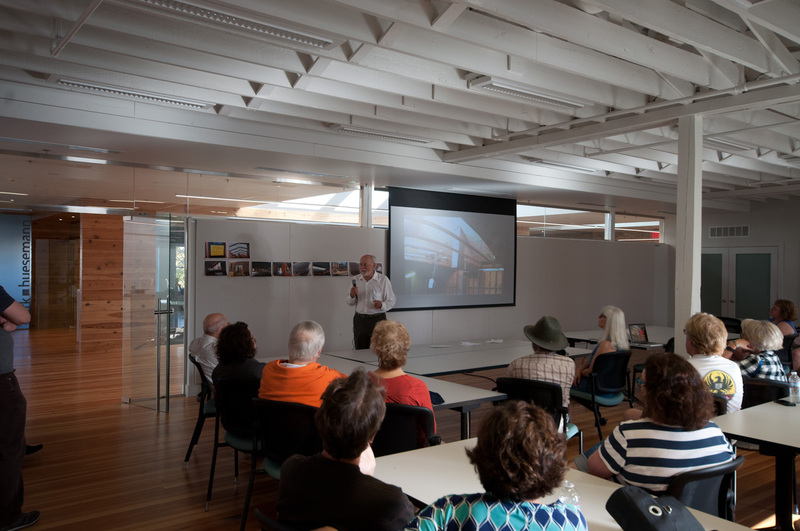 It’s quite simple: show interest in midcentury and/or modern architecture. There are no dues or fees. Simply show up and enjoy.